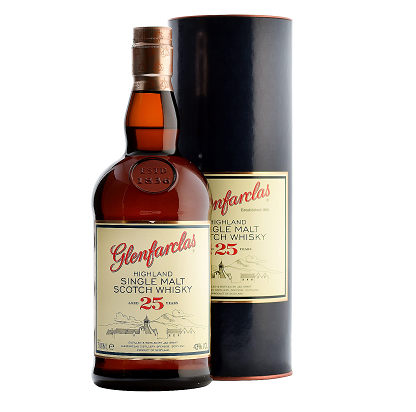 This bottle of 25 year old single malt is the result of 170 years of tradition and experience, of secrets carried and nurtured through 6 generations of the Grant family at the Glenfarclas Distillery in the heart of Speyside, which remains family run to this day. A great after-dinner whisky so rich and full that it is a dessert in itself, with a finish that goes on forever! Nose: Complex, yet refined, delicately peated, with fresh tempting aromas of marmalade, honey, freshly ground coffee, sherry and nuts. Some oaky tannins. Palate: Full-bodied and robust, the sherry and the oak fight for your attention yet neither is overpowering. A powerful nutty smokiness. Finish:Intense, long lasting, dry smoky and malty. A beautiful dark Belgium chocolate taste at the back of your mouth to complete the flavour of the 25 Years Old.